There is nothing much new about the San Francisco Ballet&#146;s Giselle and yet it may be the most eagerly anticipated program of the entire season. The perennially popular tale of a betrayed love that lingers beyond the grave has been a showcase for great ballerinas since its debut in 1841. And ballerinas are what this Giselle is all about. Bay Area balletomanes are snapping up tickets in hopes of seeing one of two departing dancers, Joanna Berman and Lucia Lacarra, in the title role before they leave the company (and in Berman&#146;s case, the stage) for good. But, of course, these two ladies cannot dance all eleven performances and Friday night&#146;s opening went to Lorena Feijoo, with the muscular Yuri Possokhov as her Albrecht. This is not a bad thing. Amidst all the consternation around losing Berman and Lacarra, two of the most popular San Francisco dancers, it would be well to take note of all the talent that is sticking around, beginning with Feijoo, the Cuban-born wonder who trained in her native Havana with the great Alicia Alonso. Feijoo first impressed San Francisco audiences in character roles that showed off her ferocious technique and wicked wit. But her precise battements and dazzling pirouettes mark her as a classical heroine as well. Of the men in the company, Possokhov, who hails from the Ukraine, is one of the best. As the curtain rises on a bucolic village where the happy, well-dressed peasants dance around all day instead of toiling in the fields, he is a commanding presence from his first entrance. He is Albrecht, a nobleman who is slumming in disguise in order to woo the lovely Giselle. She returns his affections, shyly at first, then with more passion but, as usual, trouble is waiting in the wings. The huntsman Hilarion (Damian Smith) also has his sights set on Giselle and is bent on ousting the mysterious stranger who stands in his way. Helgi Tomasson&#146;s choreography for Act I, adapted from the Petipa original, uses some of the oldest ballet conventions in the book and not always to good effect. Much of the time-honored pantomime — a circle drawn around the face to indicate beauty, a hand on the heart to show love or pressed to the brow in despair &#150; elicited giggles from the audience. Perhaps it&#146;s time to give it up. The first act of Giselle is a kind of back-story anyway. Lots of jolly peasant dances &#150; in which Gonzalo Garcia and Guennadi Nedviguine stood out &#150; and a surprise visit by the local gentry on their way back from the hunt. One of the noblewomen takes a liking to Giselle and gives her a necklace. They share confidences about the men to whom they are engaged. Unfortunately it turns out to be the same guy and Albrecht, after being unmasked by the jealous Hilarion, chooses his royal fiancee. The heartbroken Giselle loses her reason and dances herself to death. Or does she? According to the program, she stabs herself with Albrecht&#146;s sword, which indeed she briefly grabs and points at her heart before it is snatched away. But early on there are hints that this is not a well girl. She has several moments of weakness as she dances with Albrecht and her mother constantly cautions her to take it easy. We could use the services of Sam Spade or some other good private eye here because the manner of Giselle&#146;s death remains unclear. Did she die of a stabbed heart, a broken heart or simply a weak one? Ah well, she is dead and that&#146;s all that matters because this is when the real action begins. 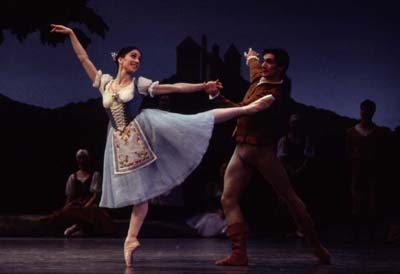 Act Two of Giselle is one of the great &#147;white ballets,&#148; which, along with Les Sylphides and the final act of Swan Lake, were often used to open an evening&#146;s program in bygone days. The curtain rises on a spooky forest of dim light, tangled trees and stage smoke. In a corner, a simple wooden cross rises from a mound. It is Giselle&#146;s grave, to which the grief-stricken Albrecht has come to mourn. But he is not alone. There are spirits in this wood, the shades of young brides who died before their wedding day. They are the Wilis and Myrtha is their queen. Muriel Maffre may have been born to dance this role. Icy, imperious, she has no mercy for mortal men. From the moment she bourees regally across the stage, Maffre is in command, not only of her bevy of abandoned brides, but of the audience as well. Feijoo, however, is her match and the "Adagio," in which she pleads for her lover&#146;s life is impossibly lovely. Possokhov also gets to show off his impressive elevation in a series of leaps and entrechats. A word for the corps here, always a highlight of this ballet. Entering with their faces covered in gauzy cloth suggesting both wedding veil and shroud, they moved with the kind of graceful precision that earned them more than one round of applause. As the sun rises, the Wilis depart and, with a final yearning gesture, Giselle sinks back down into her grave. But, unlike in some productions which kill him off, Albrecht lives on to mourn and perhaps to love another day. All of which goes to prove that genuine devotion &#150; and gorgeous dancing &#150; wins out in the end.